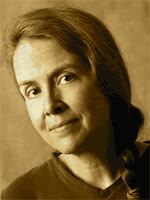 A Year of Being Here: Naomi Shihab Nye: "Missing the Boat"
"Missing the Boat" by Naomi Shihab Nye, from Different Ways to Pray: Poems. © Breitenbush Publications, 1980. Art credit: "Cwch ar y Gorwel / Boat on Horizon," by Dylan Arnold (originally color). Note: The image has since been removed at the request of the artist.